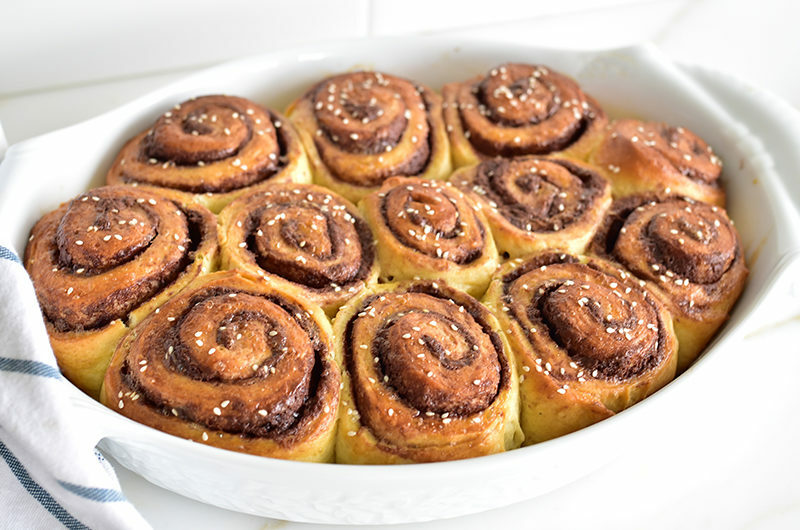 Chocolate tahini breakfast rolls are like the rich, gorgeous cousin of a cinnamon roll. 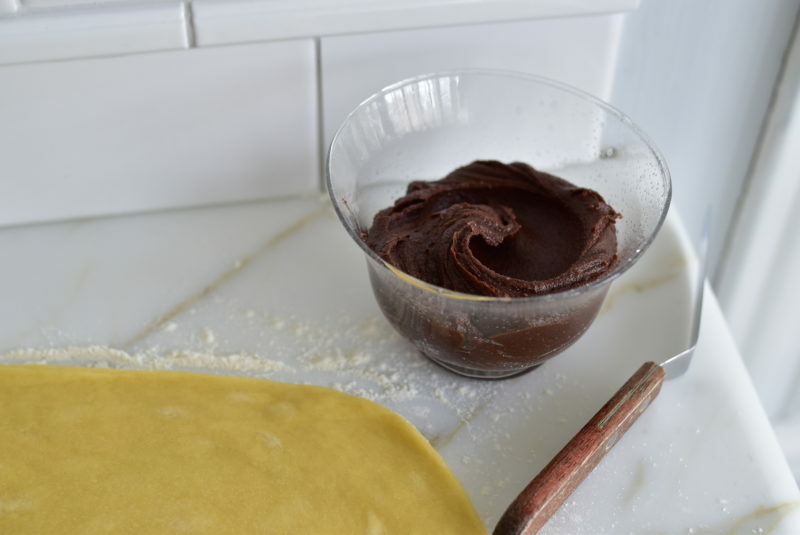 Butter enriches both the chocolately filling and the soft, pull-apartable dough. Yes, you can make these ahead and refrigerate the dough before the second rise, then bake them off like a champ morning of. It makes sense, I think, to rate one’s performance during a season of fasting, just as we rate a hundred other things on a regular basis. When I recently baked an array of desserts + dinner for my brother and family, I tried to cover as many bases as I could of the tastes at the table: the ginger molasses cookies dipped in white chocolate, cream puffs filled with vanilla pastry cream, frosted cut-outs (from the freezer). My nephew rated the cream puffs: an overall 5 or 6 especially for the pastry cream, but the puff itself, a 4 at best. I suggested that while he may not have a preference for the puff itself, and his taste for it rates a 4, my execution of it rates a solid 10, if I can say so. He smiled his irresistible smile, the true 10 at the table. We do rate things often and critically around here. It comes from my parents (well, more honestly, Dad), and probably theirs. Virtually every restaurant we’ve frequented has been left deconstructed by the clan of Abood, an entirely new menu described and a completely different design of space/table settings/napkins/service while riding home from the experience, no matter how great it may have been. Does the rating apply to our people, and their lives? Pretty much yes. I’ll leave it at that. On the upside, at its best this leads to reflection, and self-examination. I’m pretty sure this year during Lent, I heard myself explaining more than once just why it would be okay for me to eat this one dessert this one time, even though I’m not eating sweets right now. My brother Richard George just laughs, loud and hard, as I dip my spoon in. There’s more to a time of fasting and abstinence than giving up the sweets, we know this, but clearly it’s part of a discipline that people throughout history and across the spectrum of spiritual practices like to challenge themselves to. Given the rate of failure in my practice this last month, I can only sheepishly offer up a breakfast roll recipe for Easter morning. I mean, the day is already a Peeps and Reese’s egg o-rama (no, we don’t have a bunch of grade school kids at the table. Aunt Maureen still drives the candy buying bus, though…). Starting Easter off with a hit of more indulgence seems, well, indulgent. 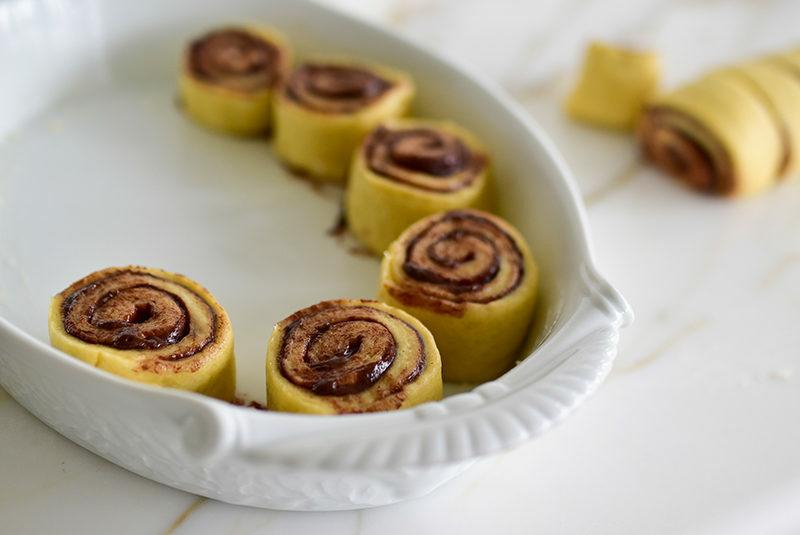 But then, it is a celebration, and these rolls aren’t quite as sweet as many, and they are filled with chocolate tahini—which if you haven’t had the pleasure of tasting this Nutella-like heaven, I beg you to get to it. I’ll go ahead and rate myself a 5 or a 6 for my Lenten performance. But the chocolate tahini breakfast rolls? Those are a 10 solid. Yes, these can be made a day in advance and refrigerated, before the second rise in the baking pan. 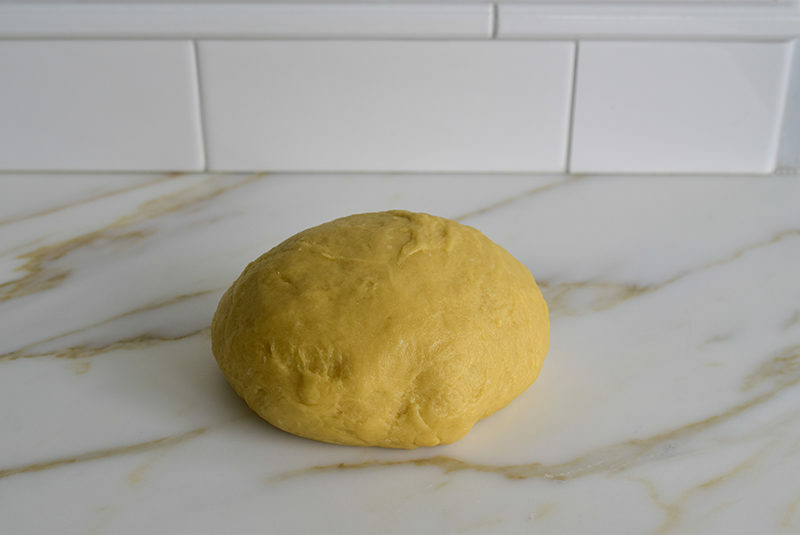 Just give yourself a couple of hours before serving to bring the dough rolls to room temperature and to continue to rise, depending on how much they rose under refrigeration. A soft, airy roll is depending in large part on a thorough second rise, so the rolls look quite puffy before baking. 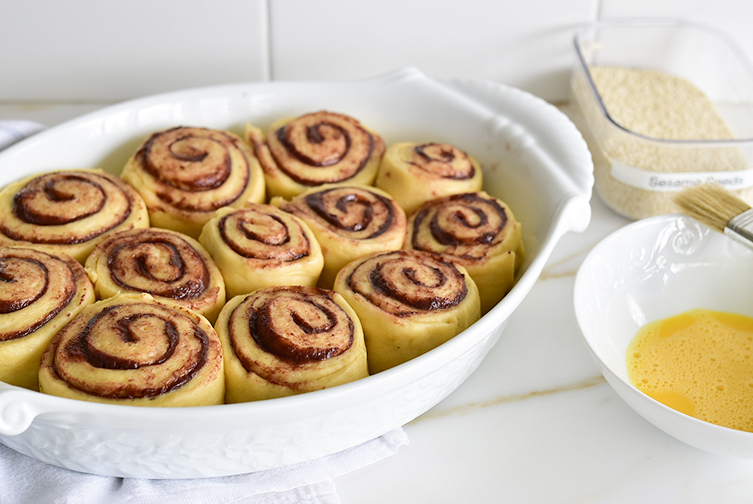 These rolls are based on the genius of Smitten Kitchen. 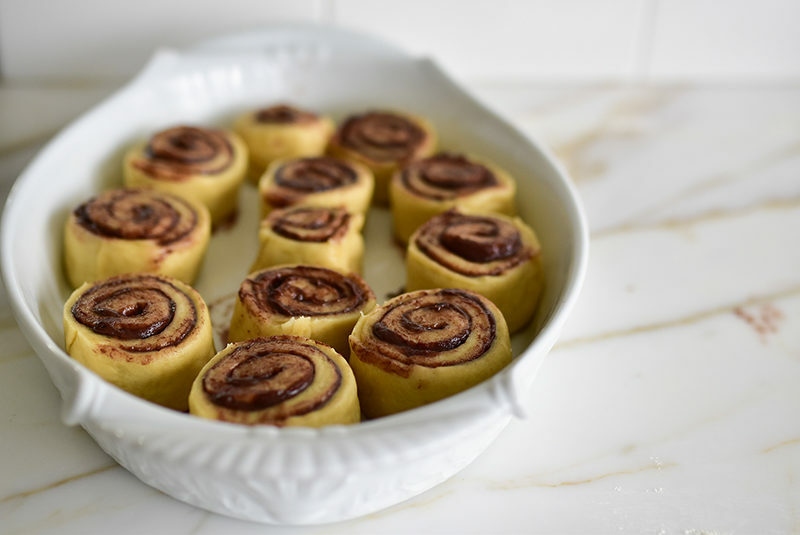 If you want and need frosting on your rolls as my husband Dan does, make a simple but great buttercream with ½ cup softened butter, 3 cups confectioner’s sugar, a teaspoon of vanilla, and ¼ cup tahini. Spread it on the rolls once they’ve cooled a bit. For the dough, in a small bowl stir the yeast, warm milk, and a tablespoon of the sugar. Set aside until the yeast is creamy and little bubbles appear on top, about 10 minutes. In the bowl of the stand mixer or other large bowl if mixing by hand, whisk the melted butter, eggs, and remaining sugar. Add the yeast mixture. 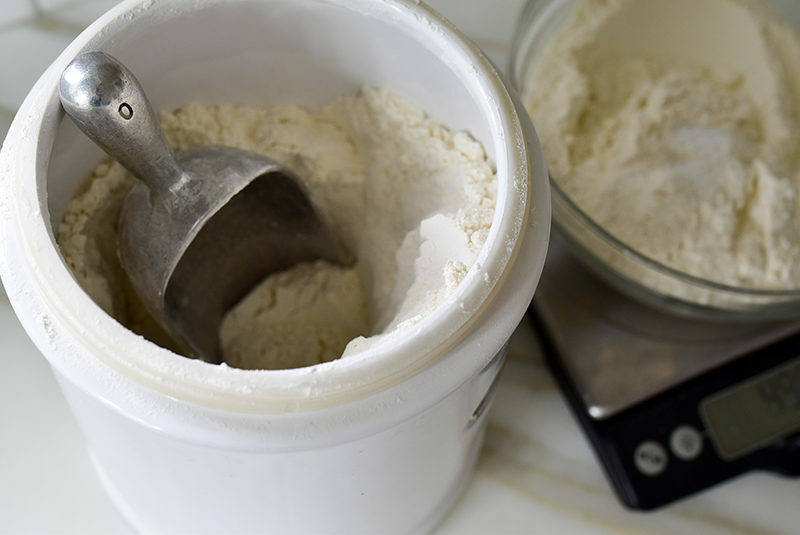 Using the dough hook, or by hand, gradually add the flour on low speed, incorporating it into the liquid. Add the salt with the last add of flour. Knead on medium speed for about 5 minutes. The dough will be soft, smooth, and slightly sticky. Thoroughly coat another large, clean bowl with oil. Turn the ball of dough in the bowl to coat it, then cover the bowl with plastic wrap (not touching the dough). Lay a clean towel over the bowl and set it in a warm place to rise. I put it in the oven on the proof setting, or in an oven briefly heated to 110 degrees. Let the dough rise until tripled in size, about 2 hours. Meanwhile, make the filling. In a small saucepan over low heat, warm the tahini and butter until the butter has melted. 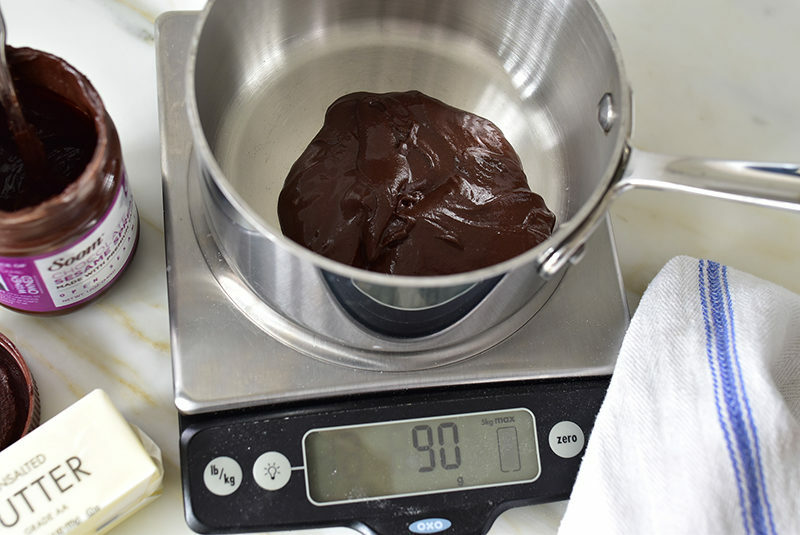 Stir until combined, then refrigerate until the mixture is solid but stirrable/spreadable. Butter a baking dish about 9- to 10-inches wide by 13- to 15-inches deep, or about that size. I like to use a beautiful dish that can go right to the table. 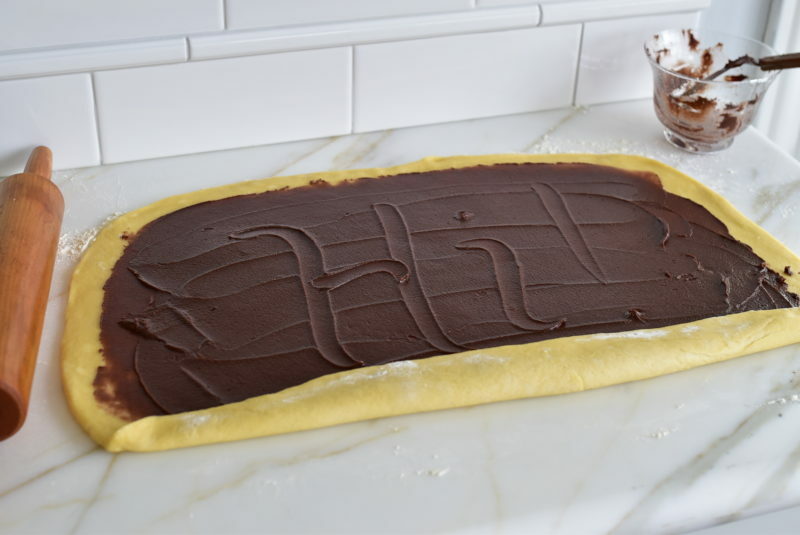 To make the rolls, turn the dough out onto a large, well-floured countertop. Roll the dough to about 18 inches wide and 15 inches deep. 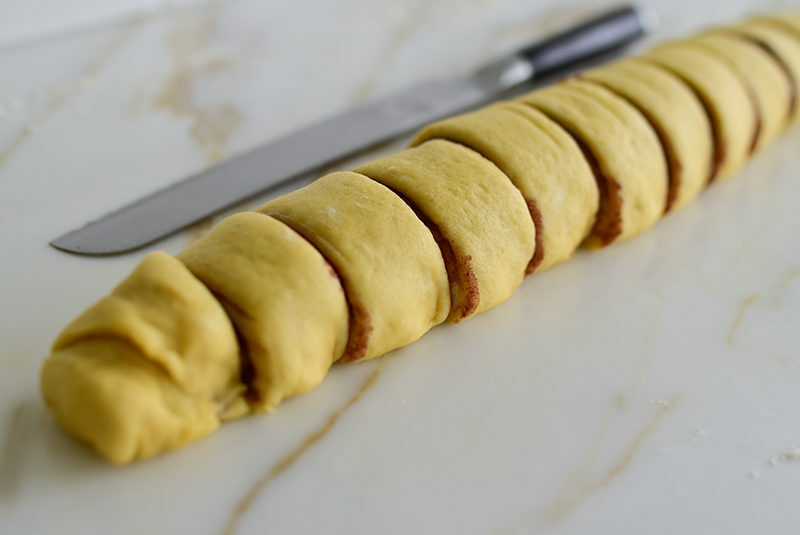 Tightly roll the dough lengthwise (the long side is rolled). Pinch the seam closed as tightly as possible, fatayar-style. Which means: keep pinching and pinching until you feel the seam won’t open. It still will, a little, but we gave it our all. Turn the log seam-side down. Using a very sharp serrated knife, score the log into 2-inch slices. Keep a big piece of paper towel or cloth handy to wipe the knife as you cut. Slice the log, wiping the knife blade after each cut. Carefully place the rolls, spiral facing up, in the prepared baking dish. Cover the dish with plastic wrap and a kitchen towel, and set aside to rise until very puffy, about 30 minutes. Or, refrigerate the covered rolls overnight. Be sure to take them out of the refrigerator a couple of hours before baking to bring them to room temperature before baking. Heat the oven to 350 degrees, with the rack in the center. Brush the tops of the rolls with egg wash, and sprinkle lightly with sesame seeds. Bake the rolls for about 30 minutes, or until golden on top and cooked through. Take care not to overbake the rolls; the internal temperature of the rolls around the perimeter of the pan should read about 180 degrees. 2 Responses to "Chocolate Tahini Breakfast Rolls"
Yay Soom chocolate tahini! Your rolls look amazing, and I bet they taste even better! Hugs!! !